Please note that the show opening is postponed until Saturday July 12, 2-4pm due to the power outage. I’m very excited about the new body of work I’m creating. Fairy tales is the theme and I’ve been immersed in them – reading them again, listening to them online, falling asleep with my heroine young women in my head (Rapunzel, Red Riding Hood, Thumbelina). Without realizing it, I chose tales that featured young women – all overcoming challenges like confinement, sexual assault, loss of family and isolation. All are transformed in the process and emerge stronger. My ‘painting materials’ were old watercolours of mine — mostly from my former life in Toronto. They are transformed in my studio to tell this visual story. I began this journey with a group show in Bear River organized by Ken Flett. The theme was Fairy Tales and I reluctantly agreed to create a piece. I don’t usually work to themes, preferring to paint what inspires me at the moment. 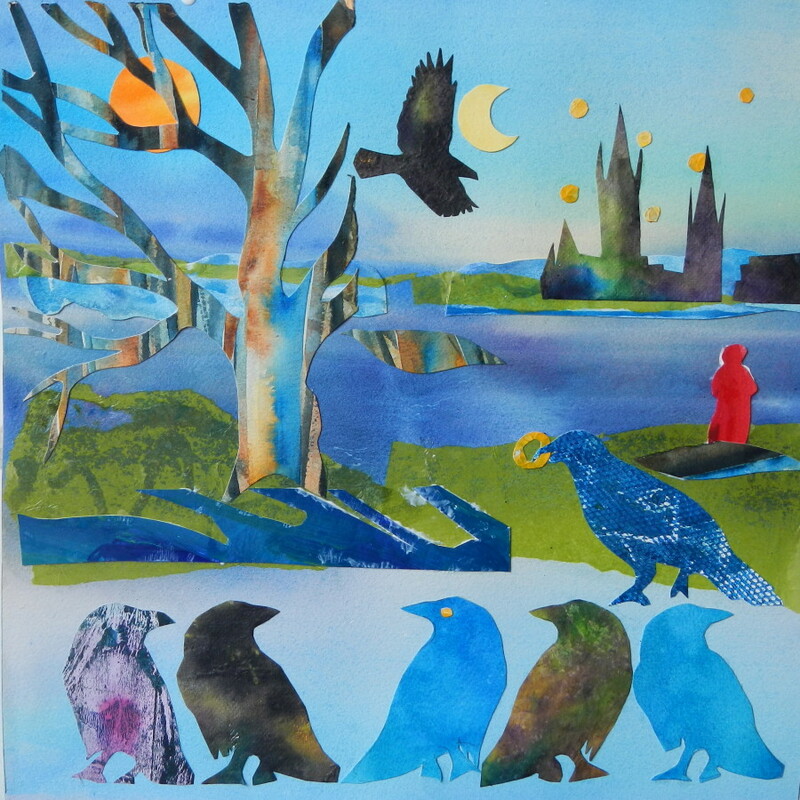 It was a fun challenge to paint to theme and to explore collage as a way to paint. I am a member of the Arts Council in Annapolis. It’s a vibrant, happening place and they offer spaces for shows for its members. The tiny Mym Gallery is set aside for artists to hang experimental work or journals or process pieces. When my name was drawn for the current show, I decided to create a series that would be different from what I usually paint. That’s where these 6 images came from. 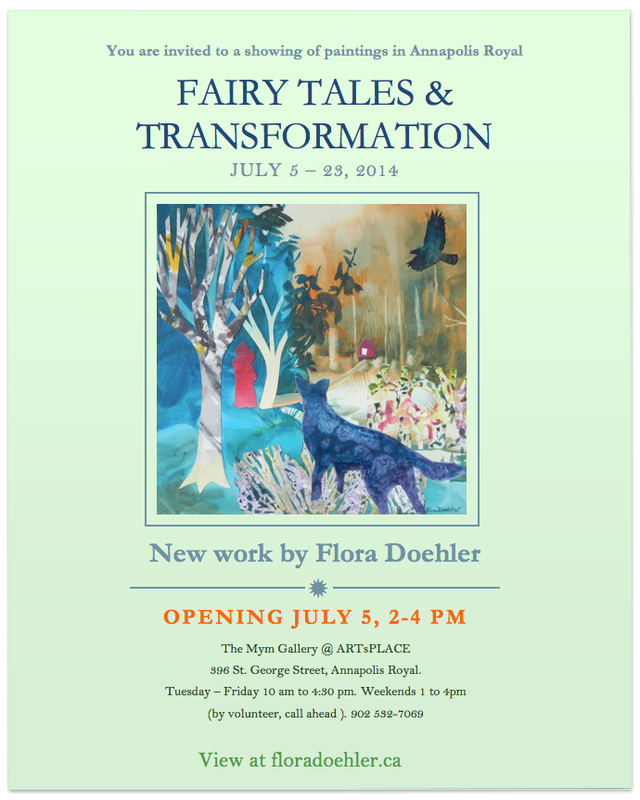 Please drop by to see me on Saturday, July 12 th for the afternoon opening. I’ll be there the afternoon of the 20th as well. For those of you who can’t make the journey, I’ll post all the images here over the next week as well as my thoughts about the stories that surfaced. Next week, I’ll be back to painting my favorite fairy tale…my garden. Gorgeous Flora, Bravo, or should I say Brava! Lovely and powerful images. Have a great show! Wish I could be there. P.S. Love the crows the most — one of my favorite birds! All the best on the opening in Annapolis Royal. Sorry we can’t be there. Can’t wait to see the full scope of the work. I love that you can step out from your comfort zone and and work with new themes and different technique. An inspiration! Stunning work Flora! – poetic, magical, evocative. This seems like a natural direction for you to take. All the best for your opening! I enjoyed working on these so much that I have been ‘deconstructing’ scenes before me into coloured shapes. I have just now posted all 8 images in the ‘paintings’ section and will do a little blog post with photos from the show to give a sense of the scale. Marcia, thank you – I value your opinion and your comments are much appreciated! Now that we finally have power again after a 4 day outage, I feel ready for the rescheduled opening on Saturday!